Who doesn’t love to carry a regal outlook? At one point or another we do fantasize ourselves in some alluring royal outfit, flaunting our beauty in pretty embellished capes. Well! All your fantasies are about to get real this year, as cape style apparels are hitting the stores in the most fascinating designs imaginable! Though this trend is new in town, but it is gaining great popularity since the last year, now people are seen wearing capes, not only on the ramps or in fashion walks, but everywhere. 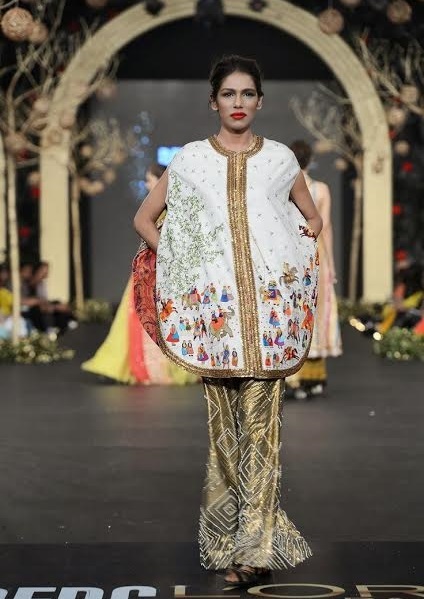 So, this piece of writing will introduce you to a variety of designs of cape style dresses designed by Pakistani and Indian fashion designers this year. In Pakistan, plenty of our talented designers have taken a shift towards this particular style and created masterpieces using the same idea. These are designed both for casual and formal wears. Detachable, fused or shoulder capes every possible style is here in the latest cape collections. 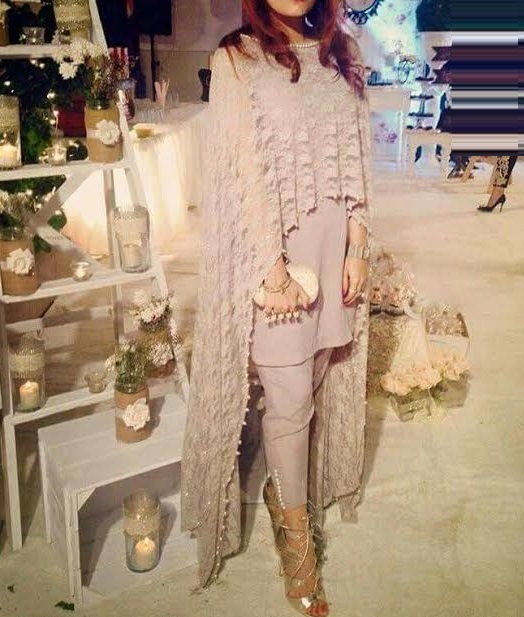 Capes look quite elegant and graceful and are a preferred choice of those ladies who love to stay covered with modest clothes especially on parties and weddings. 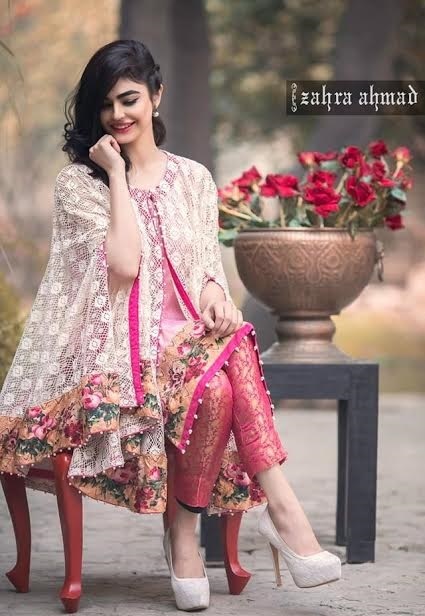 Stunning designs of heavily and light embroidered short, medium length and long capes in chiffon, net, tissue and organza stuff are covered up in this section so you may pick up any style according to the function that you are just going to attend. Cape Style dresses can be paired up with any bottom style like short Capri pants, trousers or palazzo pants, but the recent trend is to pair them with bell bottom trousers. 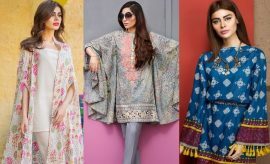 Cape Styles Dresses 2017-2018 Designs in Pakistan designed by popular Pakistani fashion designers like Zainab Chottani, Maria.B and many more renowned designers have all been displayed in the section below with different categories like casual wear, party wears and wedding wear cape style dresses. Let’s dig in deeper to find out about the best of the latest cape style dresses 2017 in Pakistan. Keeping in view their popularity, we have brought you the one of a kind apparels in wide varieties. As trends are shifting towards more causal styling, designer’s are creating amazing lines for casual wears. Same goes for the cape style dresses where lovely yet simply dresses are crafted with little or embroideries at all. The most comfy of all are the ones with fused cape shirts style, which are either designed in pure printed cotton. These can be worn whenever you go for shopping or going out friends. Their simplicity has made girls crazy after them. It’s entirely up to you whether you go for floral prints or the block prints, cape shirts look equally good in both. These cape shirts are however designed in short lengths and rounded bottoms. 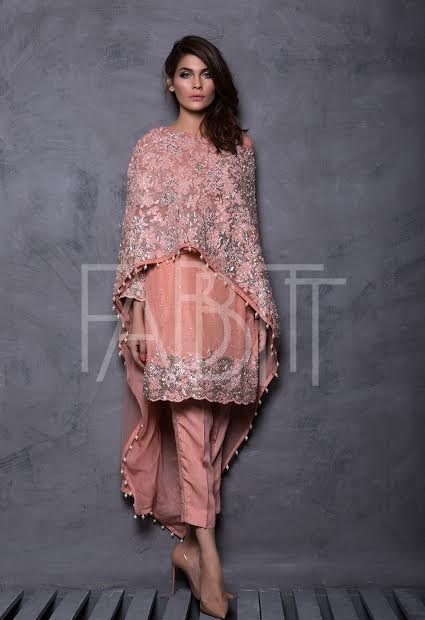 Another nice way to carry cape as your routine outfit, is to get it lightly embroidered with hints of thread work, around the neck or sleeves. Designing these cape shirts in chiffon or Georgette is more desirable. Bell bottoms are perfect complements these cape dresses. They highlight the elegant drape of the capes. Either fuse these with the inner shirt or carry them as an upper. Another great option to carry cape is to pair it with tulip pants. As tulip pants has this soft touch, which makes the entire attire elegant. Using a contrast in this regard further more adds a particular charms into it. Dresses for parties demand something unique and distinctive. You can’t go for something simple and not even go overboard with heavy embellishments. 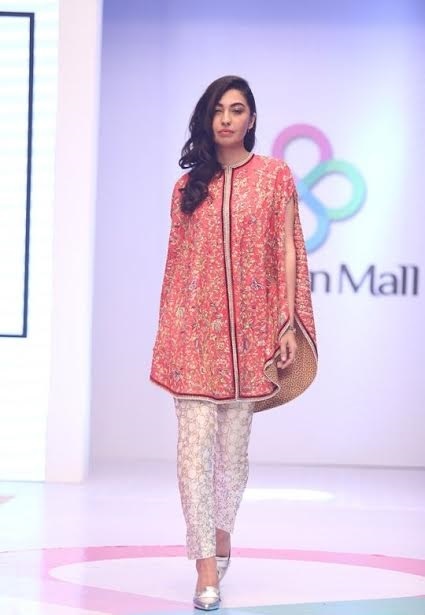 What you need is balance of embroideries, hues and cuts. 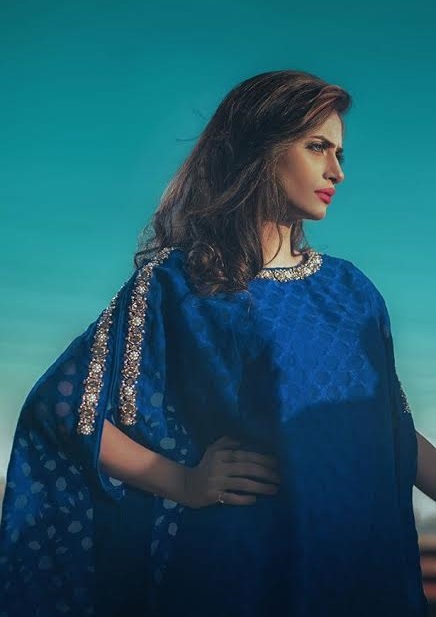 Keeping the same idea and mind, eminent Pakistani designers have designed pretty cape dresses in accordance to the party style. These elegant in form, yet appealing to eyes. Extended shoulder capes are the most popular of all, these are embroidered over the front or around the borders. The inner dress is kept completely simple and plain. This is how an amazing blend is created. 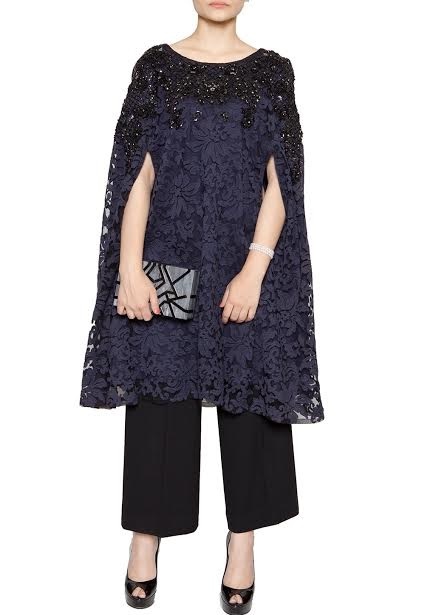 Capes in net and lace works are also a perfect option to carry to decent parties. These capes are either fused to the shirt or carried separately with the front open or slit style. Its lace work adds most of the beauty in to it. 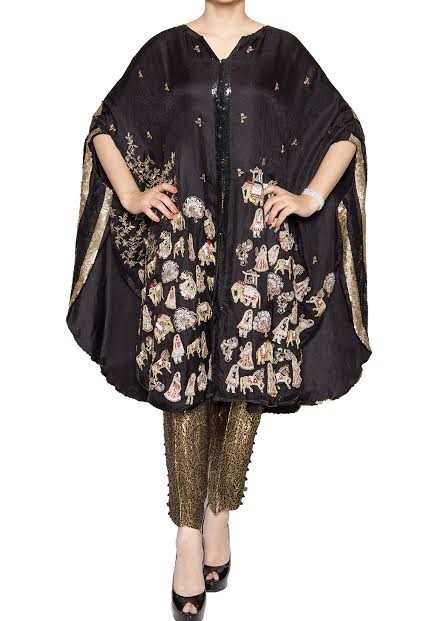 Such cape dresses look perfect with embroidered cigarette pants or pencil trousers. 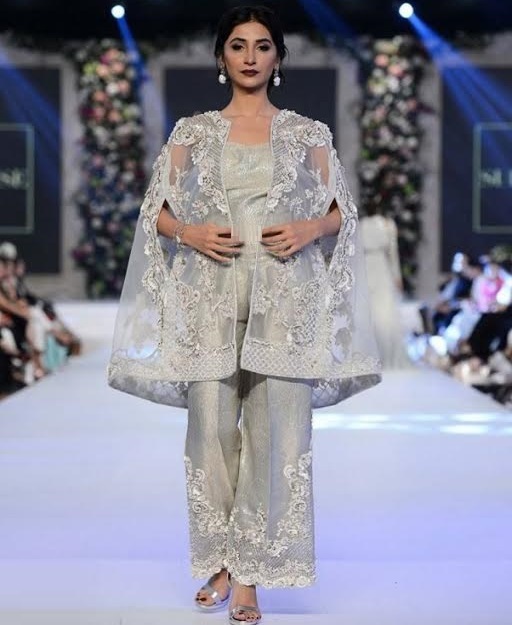 Nothing can look trendier than a cape for wedding event, especially when your cape is glittering with heavy embroideries of Dabka, Zari and Zardozi. 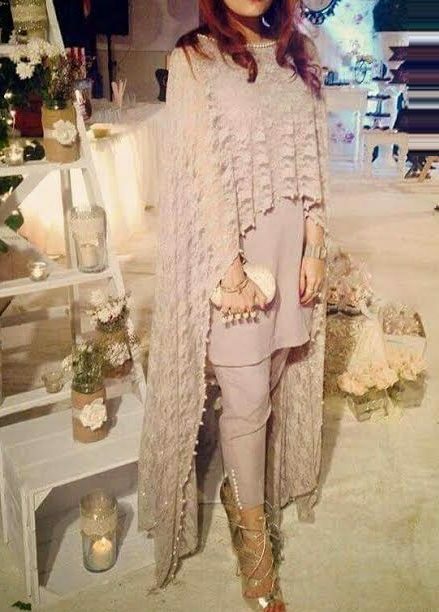 Particularly for Walima reception, cape dresses in beige and fawn, looks absolutely stunning with bolts of embroideries. The sneak peak of the latest wedding wear collection, has variant designs. One thing which is common in all are slim curves of these dress. In some dresses, the embroideries are focused more over the shoulders which tastefully highlights the pectorals. While others carry embedded embellishments in gold and silvers. Capes are designed in consistent with the colors of the bottom. Their styling are so diverse that no matter which type of bottom you try with them, it all fits together. Wedding cape dresses are distinct because of the layers of fabrics used in them. Moreover the length and fall of their drape is also different from others. Its drape must be ankle length long to create a fine outlook. 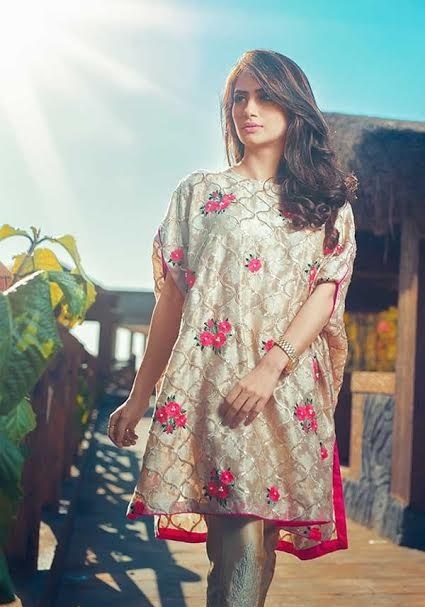 You can buy these alluring designer wear cape style dresses from the relevant brands’ outlets or you may copy the designs on your own fabric with any sort of customization you like. Do let us know if this collection helped you find something trendy. Leave your feedback in the comment box below. Stay tuned with StylesGlamour for more dressing ideas and Trends Alert for the upcoming wedding and party season.